Excerpt from ERCOT's "Understanding: Texas Nodal Market Integration"
For a more readable version, check out the full brochure, which is evailable from ERCOT’s website. 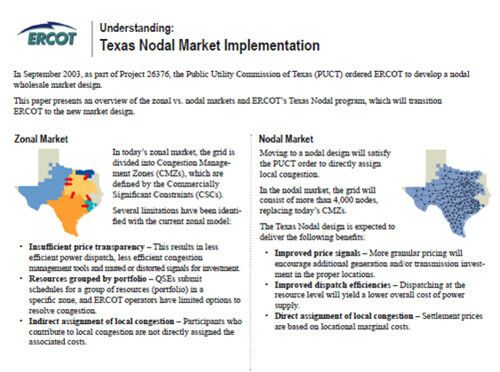 ERCOT’s “Texas Nodal Market Implementation” site has more information. Think of a patient who complains to the doctor of pain in his right leg, but can’t finger the exact location. That’s zonal. Treatment of an entire leg will not be very precise or efficient. It will therefore cost more. A patient who can say the pain is localized on his rightquadriceps femoris is likely to get more precise and efficient, and therefore cheaper, treatment. Similarly, the transition from zonal to nodal will allow the ERCOT grid to pinpoint more precisely high energy demand and congestion areas (think “pain”). Therefore “treatment,” i.e., congestion management and transmission construction, will be more precise and efficient, and thus cheaper. In a sense, “in theory” is right, but we have much more than theory to go on. Other U.S. RTO/ISO markets have started with zonal congestion management and shifted to nodal, all have resolved problems experienced under the zonal market by the shift, and no one has chosen to shift from nodal to zonal. In fact, I’m not aware of any significant constituency within any of these markets that has argued for a shift from nodal back to zonal. Given the diverse and often conflicting interests of the many entities that participate in RTO/ISO markets, this silence speaks loudly in favor of a nodal market design.